A BarCamp, where game researchers and practitioners come together and discuss digital games research, development and practice (in English and German). International and local game researchers and practitioners from all fields and disciplines. September 22th 2018, 13.00 till September 23th 2018, 17.00. The GameCamp Berlin was originally founded as a BarCamp for the scientific exploration of digital games. All disciplines – computer science, media sciences, pedagogy, engineering sciences, literature, psychology, business administration, medicine, physics, sociology, mathematics, jurisprudence, religious science – are welcome. With the aim to encourage an exchange between academics and practitioners, we decided to open the 2017 BarCamp also for people working in the game industry, who like to drop their knowledge, and get into conversation with researchers. Besides its orientation and interdisciplinarity, the GameCamp Berlin is first and foremost: an open and community-oriented forum for people working with, about or on games. There is no Call for Papers, the participants decide about the program at the beginning of the event! At the GameCamp Berlin, the computer science student discusses with the German-language doctoral student, the game designer with the media professor – on the same level! For small money there is not only food and lodging, but also exciting talks, a great evening program and valuable contacts. The researching games BarCamp 2011 took place in Wiesbaden and had 29 participants from 11 cities. The researching games BarCamp 2012 took place in Wiesbaden and had 47 participants from 20 cities and 4 countries. The researching games BarCamp 2013 took place in Wiesbaden and had 43 participants from 25 cities and 2 countries. The researching games BarCamp 2014 took place in Wiesbaden and had 36 participants from 3 countries. The researching games BarCamp 2016 took place in Berlin and had 58 participants from 4 countries. Florian Berger, Christian Roth, Felix Schröter and Annegret Montag, with the help of Melanie Fritsch. A BarCamp is an open meeting, during which all participants can and should present something. The exact program is decided at the beginning of the event. In addition, there is plenty of time to learn, play, talk, listen to music. And there is food. There are no submissions, no review processes, no special invitations, and no one rates your publication list or demo reel. The GameCamp Berlin comes to live by the simple fact that you come to Berlin, join us and present something! The exact sequence – when and what is presented – is decided by all participants present at the beginning of the event. If you would like to get an impression of what has happened in recent years, you may check out the archive and browse the press releases. The lectures, discussion sessions etc. take place in up to five parallel tracks. You can talk about any topic turning on digital games. Reports of your work, your research, a project, a software, an idea. Talk (20 minutes +15 minutes of discussion): It’s the academic “classic” – give a lecture and have a debate afterwards. Lightning Talk (5 minutes): Short presentation of an idea, like an elevator pitch. Discussion Panel (35 minutes): Prepare and moderate a discussion on a game-related topic. (Tech)Demo (20 minutes +15 minutes feedback): Show your project (e.g. a game, a tool) and get feedback. Rant (5 minutes): Rant about a digital game-related issue that bothers you. For the sake of fairness, the times are strictly controlled. Projector, flipchart, board and pens are available. We highly encourage presentations in English (the main BarCamp language), but German is fine as well. After your lecture, we would like to document your presentation in the archive. You can find out how to do this during the BarCamp. The GameCamp Berlin is a join-in activity aimed at people who study games or/and work in the industry. If you do not present anything, who else would? We are sure you have something interesting to say. In case you are absolutely too stressed out to prepare something, but would desperately love to join us nevertheless, we have a small contingent for participants who do not want to present. You can book those in the ticket store as well – however, accomodation will not be included in these tickets. We have a Friendly Space Policy every participant is kindly requested to act on. The GameCamp Berlin 2018 will take place from Saturday, September 22th, till Sunday, September 23th 2018 in Berlin. The venue 2018 will be the Youth Hostel “Jugendherberge Berlin Ostkreuz“, Marktstraße 9-12, 10317 Berlin (map). along Neue Bahnhofstraße and Boxhagener Straße. That way is at ground level, but a bit longer and winding. over the bridge Kynastbrücke and Kynaststraße. You have to take the stairs up to Kynastbrücke, but the way is a bit shorter, and the Hostel is in view all the time – it is hard to go astray. The Youth Hostel as well as Hauptbahnhof, Alexanderplatz and Tegel Airport etc. 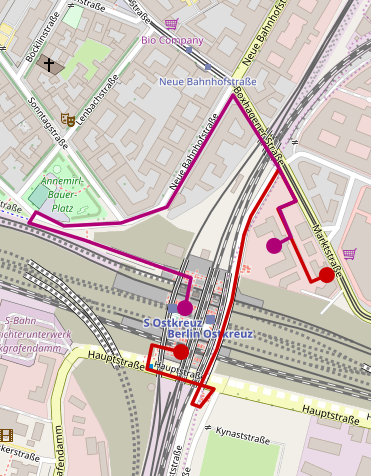 are located in Nahverkehrszone A+B. An Einzelticket A+B (single fare for the zones A+B) is available for 2,80 € and is valid for 2 hours for a single fare in one direction. It is possible to intermit the journey (but no round trips!). A good option is the 4-Fahrten-Karte A+B (4 single fare tickets) for 9,00 €. Do not forget to validate your ticket at the station platform before boarding a train! Please note: If you arrive and leave by airplane via Schönefeld airport you have to purchase an Anschlussfahrausweis for the zone C (1,60 €). In case your stay extends two days you might consider acquiring a Berlin Welcome Card, which not only includes public transport, but also some discounts for sightseeing. Please note our Security Advice below! Berlin is not a very car-friendly city. Particularly in the city centre longer traffic jams as well as events and the ensuing road closures may occur, and there is a lack of parking spaces, too. We recommend to leave your car in a car park and use local transport. The GameCamp Berlin will take place at the Youth Hostel “Jugendherberge Berlin Ostkreuz”, Marktstraße 9-12, 10317 Berlin. Those of you, who have booked an accommodation will spend the night in this very Youth Hostel. The next train station is Berlin Ostkreuz. Berlin is generally a safe place. Nevertheless, it is a huge city with more than 3 mio. inhabitants plus visitors. As in every other city in the world, there are pickpockets, especially at tourist attractions, and other crowded spaces such as the public transport or train and subway stations. Sometimes, unfortunately, even violent encounters may happen, especially in party areas and nearby train and subway stations. For that reason, please be attentive when using public transport or being in party areas during nighttime. We have made reservations for double-rooms in the Youth Hostel. The overnight stay (September 22th – 23th 2018) is included in your participation fee. When you book your ticket, please make sure you chose the correct ticket category as we need to know, how many of you will make use of the accommodation option. Of course you may organize your own accommodation according to your preferences and needs, but this will not lead to a reduced participation fee. We will take care of a catering. Saturday evening we will have dinner together before the party starts. Sunday morning, those who stay at the hostel can also have breakfast there. On Sunday afternoon, we will organize a warm buffet at the BarCamp venue and have lunch together. We will try to cater for vegetarians as well. Water and juice are also available. Internet access will be available at the venue. The GameCamp Berlin does not make any profit. However, expenses for room rent, equipment, technology, catering, etc. are incurred. To cover a part of this, a ticket price of 35, – € per participant is charged, which has to be paid before the event. The price includes accommodation and the above mentioned catering. Please make sure that you book the correct ticket category, so we will know, whether you will make use of the accommodation option. The GameCamp Berlin is funded by sponsors, all of whom we would like to thank. Further information on sponsoring can be found here. Registrations are binding. If you withdraw from your registration, we have costs incurred, which are higher the later you cancel. In the case of a withdrawal, we can therefore only refund a part of the fee. Cancellations up to one month before the start, we charge 50%. Beyond that, there are no refunds. In any case, we can try to contact people on the waiting list so that you can offer them your place. If you want to cancel, please contact us. Register (once registration is open), prepare your lecture or demo, come to Berlin, sign up for a slot and present! Please use #gcb2018 at Twitter, Facebook, Flickr etc. 1. Join us from afar! 2. Participate and support us! Write about GameCamp Berlin in your blog (and link the documentation). You can also become a sponsor! Did we inspire you? Then register once registration is open! Would you like to support us? Become a sponsor! Do you have any other question? Please feel free to contact us!